In our last episode, Lieutenant Colonel Candace Dare was mired in paper work. She met an internal auditor from Recalcitrant Laboratories who offered to help as far as his company was concerned. While they we at dinner, she was slipped a drink that knocked her out. For those who missed it entirely click here. Fitzhugh looked at the accumulated pile on his desk. Most of the files were checked by Colonel Dare. Numerous paper clips marked irregularities that Dare found in the accounting. It was his job to decide how to investigate them. At least she knows what she is doing, Fitzhugh thought. Fitzhugh piled into the work, putting some files in piles for further investigations, other he put in inter-office envelopes for the General Accounting Office to follow up. In all the files, Fitzhugh noticed the money added up to more than the IG office cost. Well, at least Dare gives us some clout. “General, I’m going to step out for lunch,” Hutton said. “Thanks Will.” Fitzhugh decided to take a break too. He reached in his bag and brought out his peanut butter sandwich and a couple of carrots. He really didn’t enjoy the officer cafeteria. All the lower ranked officers clustered around generals and colonels, vying for attention. It was like Berlin in ’48 when the blockade was on. As a major in intelligence, he was working on keeping track of the Russians. When the airlift started, however, it was “all hands” in keeping the supplies moving. The Germans were mostly orderly, but they were persistent in trying to be noticed. The captains and majors in the Pentagon reminded him of starving civilians. Not that they were starved for food, but certainly the notice of the higher grade officers. He hated the political game in DC. He hated working at the “Pimple on the Potomac,” as he called the Pentagon. He hated feeling guilty on taking Emily to Aberdeen – that should have been Dare’s assignment. I just needed to get out of this accursed building, he thought. He sighed and wondered if he should call the Criminal Investigation Division and report her missing. A colonel dressed with CID patches walked in. “Yes, Colonel Parker. My Chief Investigator, Lieutenant Colonel Candace Dare, seems to be missing,” Fitzhugh said. “When was the last time you saw her?” Parker asked. Hutton checked his log. “Yes, Sir. It is Owens, Winslow Owens. “What’s this all about, Colonel?” Fitzhugh asked. “Colonel, you’ll be the second person who knows,” Fitzhugh said. She began to feel conscious. She learned after being captured by the Gestapo – once by accident and twice planned – so she knew what to do. She knew she should not open her eyes until she really had to. She listened first. She felt a little nauseous; she thought that it might have been some sort of drug. She barely wiggled her fingers and toes to make sure she had use of her limbs. She touched her fingers beside her to figure out what she was lying on. It felt like concrete. She heard a noise and stopped moving. There was a big clank and a fan kicked on. The temperature dropped. It must be one of those air cooling systems they’re talking about putting in the Pentagon, Dare reasoned. She decided that the noise could cover up some noises from her. She scratched the floor with her fingernail. It was concrete, but covered by that coating that she saw in hangers. She wondered what it was called. The noise stopped. Again she listened. Nothing. She decided to chance it. She opened her eyes to just a slit. It was tough to see through her lashes, but she could make out some things. The room was dark, but well-lit just around the corner. There was a blackish haze she couldn’t quite figure out. She noticed they dressed her in an orange jumpsuit and nothing else. No shoes or belt. She scanned the room as best she could and saw no one. The Gestapo used to have someone watch at all times. The moment one would open their eyes, they would be all over them. She liked making them wait, that made them a little off-balanced. There was no one here to play with. She decided to open her eyes all the way. The black haze was a wire mesh, attached to strong stainless steel looking bars. She was in a cage. 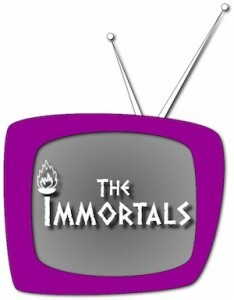 This entry was posted in The Immortals. Bookmark the permalink.